Deva House: Ennion Edgar Rowland / Ennion Mrs.
Ennion Thomas, accountant, house and estate agent, agent to Law Union Fire & Life, Railway Passengers' Accidental, and London and General Plate Glass Insurance Cos.
Moody Miss Harriet, brewer, and wine, spirit and hopmert. Wrexham House: Maypole Dairy Co. The son of James and Mary (neé Hopper), James Neal York was born in Whitechapel, Stepney, London and baptised at St Mary's, Whitechapel on 6th July 1831. In 1841 he was living with his parents in London, and on the 1851 census it lists his father as a Fellow of the Royal College of Physicians and young James was a 'Legal Pupil'. By 1861 he'd become a solicitor and was living in Snailwell Road in Newmarket. By 1871 he'd moved to a few doors along from here at No.78 High Street, where he stayed until at least 1881. James was a founding member of the 9th Cambridgeshire Rifle Volunteers. Formed as a sub-division at Newmarket with Astley Paston Cooper as Lieutenant and James as Ensign, and in April of that year they were joined by Samuel Gamble, who became a surgeon. The corps was then shown in the army list for July 1862 as being 'united' with the 1st Suffolk Admin Battalion and in the following month it was removed from the Cambridgeshire list having been absorbed into the 20th Suffolk Rifle Volunteer Corp.
James slowly rose through the ranks, becoming a Lieutenant on 7th July 1864, then Captain and then on 9th June 1877 a Major. Until on 27th November 1878 he resigned his commission. James was the solicitor acting for the sale of the White Lion public house in April 1870. He was initiated as a Freemason at The Isaac Newton University Lodge in Cambridge on 29th April 1884 and became a member of the Etheldreda Lodge in Newmarket in 1885. His name is shown on a wall plaque on the side of the Southfield Pumping Station, which was built in 1884. 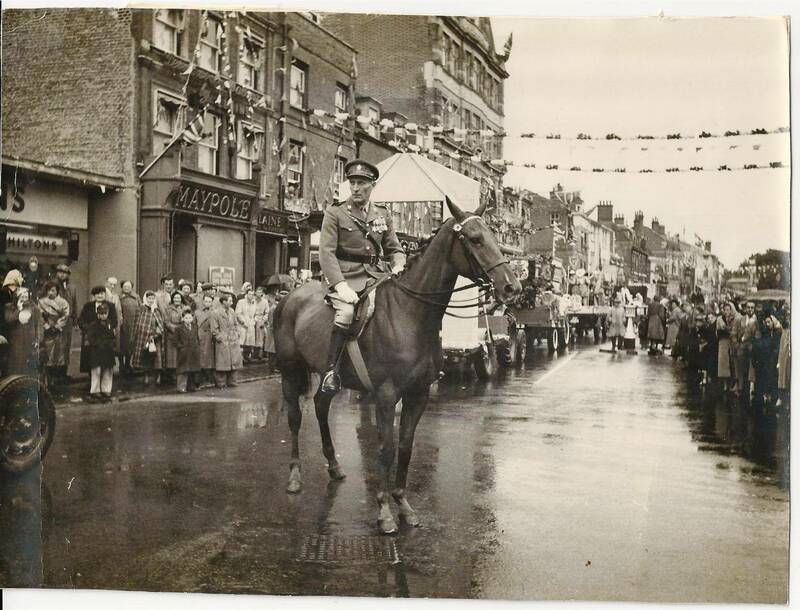 Details of this can be found on the page for Newmarket's Watercourse. James died on 9th July 1886 and by that time he'd moved here to Deva House. At this point, from the details above, you'd think that James' life had been reasonably fullfilling, but there's one key aspect that's missing here .... his business in Newmarket was at one time known as Phillips & York and their offices were in Albion Street. The Phillips that was part of this partnership was Charles Phillips - and he was a very colourful character. James York's relationship with Charles probably explains why he ended his days here in Deva House. The story goes something like this - first there were the Pipers, then there was Charles Phillips, then there were the Moodys, these were related to the Ennions and between them they owned the Kings Head brewery that started in this building in the High Street and later moved to Albion Street - where Phillips & York had their offices ... it's a wonderfully complicated story, and one that makes the basis for one of the best business successes in Newmarket (well for a while anyway). As Charles Phillips' story is mostly about his brewery interests and not his legal prowess, his life history is given on the page shown in the links below for the King's Head Brewery (it's better to read the section below first to fully understand the story). Although this map doesn't make it entirely clear what was the extent of the King's Head, comparison to the other inns either side of it in the map does give us an idea though. Firstly the Fox & Goose (later the Wellington) - based upon early 20th century aerial photos of the roof line of that building, it's known to have fronted onto the High Street ... and then there's the Greyhound (later the Carlton - No.82 High Street) - based upon a plan of the Jarvis Hotel that existed on that site in 1883, this was also an extensive building and would have most likely existed over most of its shaded area shown on the map above. 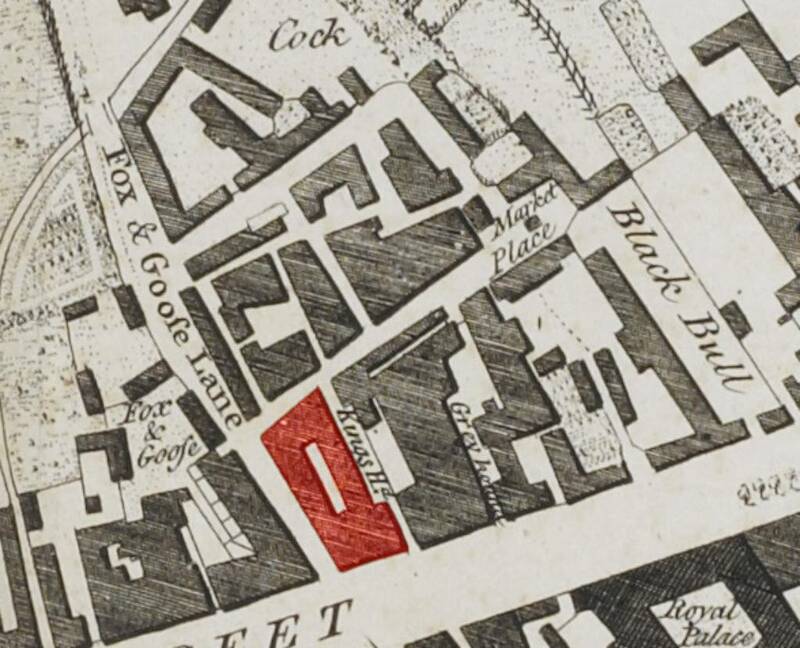 It's therefore a reasonable assumption that the King's Head, which was both an inn and a brewery covered the whole of the area shown in red on the map, upto 'Fox & Goose Lane' - now Wellington Street. As the 1862 newspaper article below states, at one time there were gates at the entrance into the dray yard on the right. 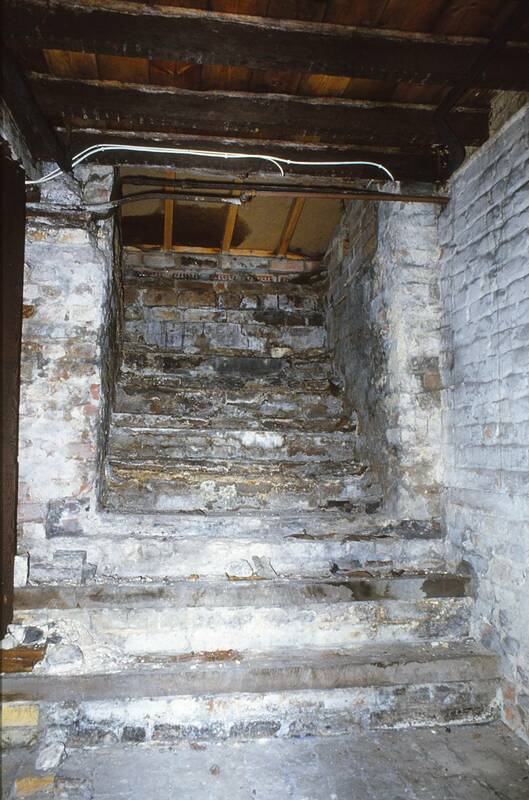 The photo at the bottom of this page, taken in the basement of Hadley House, shows the trap doors and the dray delivery chute - where the barrels of beer were delivered down into the cellar from this yard. Originally the King's Head was a public inn, but none of the earliest Newmarket trade directories list it as such. The earliest directory record shown is for Tyrell Moody in 1823 as a brewer in the High Street and by 1841 it can be confirmed using the sequence in the census that this is the location of his business - hence by this time the building had fully converted to being just a brewery. The King's Head is not listed as a Tavern, Inn or Public House in Robson's Directory of 1839. Fortunately prior to the directory listings is this 1797 newspaper report shown below, that confirms the use of the King's Head as an Inn. The article would have been about Tyrrell Moody senior, as junior would have been only 16 at the time. On Friday last, between 12 and one o'clock in the morning, a fire broke out in the hay-loft belonging to Mr. Tyrrell Moody, at the King's Head Inn, in Newmarket, which raged furiously for some time, but by the activity of the inhabitants, and having plenty of water, the flames were extinguished, after consuming the lofts and damaging the stables very much. From what cause the above fire was occasioned remains at present unknown. On Saturday last, Mr. Tyrrell Moody, of Newmarket, to Mrs. Frost, widow of William Frost, Esq. late of Brinkley Hall, this county. On Saturday last was married, Tyrell Moody, Esq. of Newmarket, to Mrs. Catharine Frost, widow of the late Wm. Frost, Esq. of Brinkley-hall, Cambridgeshire. After Tyrrell's death on 19th January 1858, his brother Thomas and his daughter Harriett moved in. Some excitement was occasioned in this town on Friday morning last, by a report, unfortunately true, that Mrs. Sarah Jeffery, cook to Mr. Thomas Moody, brewer, of High-street, had committed a most determined and dreadful act of self- destruction by jumping from the attic window, a height of forty feet from the pavement. The deceased, about 60 years of age, was a native of Newmarket, and in the early part of her life was periodically afflicted with hypochondriacal disorder, for which about 25 years ago, she was an inmate of lunatic asylum. Having to all appearances, recovered, she was removed home to the union, where she remained tolerably rational till about 18 months ago, when she was engaged in the family of Mr. Moody, and has since continued in a cheerful and comfortable state. However, at the change of the last moon, symptoms of her old malady began to develope themselves, and intervals during the last fortnight she was morose and fretful, and when the fits were upon her she trembled violently, and frequently said that she " must make a hand of herself," but was easily soothed by the gentle remonstrances of Miss Moody, her mistress. On Thursday evening she was more than usually cheerful, and on going to bed appeared quite merry and happy, and about midnight the paroxysm of her disorder returned with greater force, and her raging so alarmed the housemaid who was sleeping with her that she was obliged to go to Miss Moody, and others of the family, for assistance, but on their return to the room they instantly aware of her horrid fate by the fact of the window being open and the unfortunate woman gone. At the time she jumped from the window, police-constable Baldry, who had only a minute before passed under the window, was standing between 40 and yards from the place, and hearing the crash of her fall upon the pavement, he went cautiously towards the spot, thinking the noise might proceed from an attempt at burglary, but was horrified at finding the deceased lying upon the footway with nothing more than her chemise upon her, and her nightcap a distance. On fitting her head upon his arm she feebly muttered " Wherever am I got to?" He wrapped her in his great coat and ran for Inspector Steggles, and on his return the family, who had procured assistance, opened the gates, and the poor creature was conveyed into the house. Mr. Gamble, the family surgeon, was soon in attendance, but this skill was of no avail. It appears that the deceased fell upon her hip and side, which completely smashed her ribs and injured the spine, but her legs and arms were not broken. There was only one small spot of blood upon the pavement, but the internal hemorrhage have been considerable. Just before her death, which took place exactly an hour after the rash act was committed, she exclaimed " Oh, Good God, whatever have I done," and prayed for forgiveness. An Inquest was held at the Greyhound Inn, before G. A. Partridge, Esq., on Saturday last, when a verdict of " Unsound mind" was returned. Further details about the brewery and its later history can be seen on the page for the King's Head Brewery. Thomas Moody died on 21st December 1865 and in July 1866 his grandsons; Walter Tyrell, Robert (Hassall) and Frederick, better known as the 'Moody Brothers', bought the Albion Street Brewery from Charles Phillips, following which the King's Head name transferred to there. Harriett Moody continued to live here in the High Street, but had the building converted into two properties - the section in the courtyard became Hadley House (No.92) and that fronting the High Street later became Wrexham House (No.94). She continued to live in Hadley House until her death in 1899. 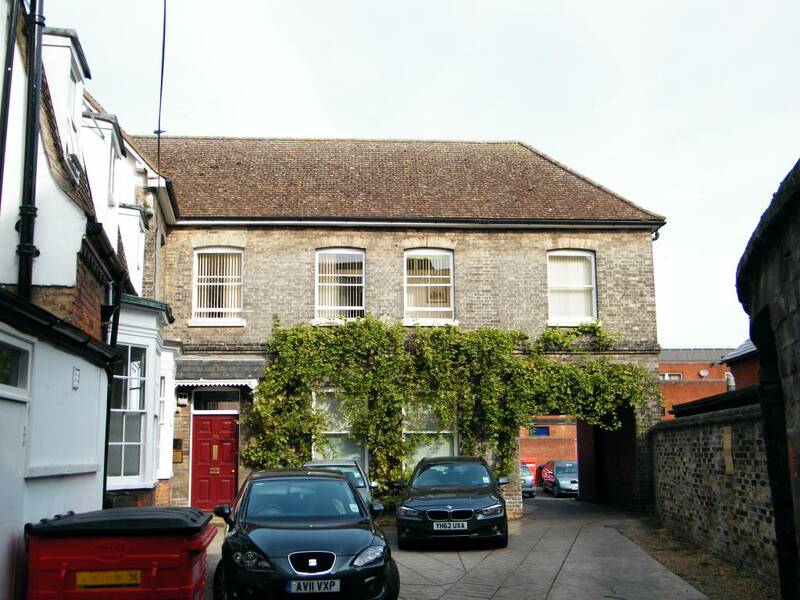 She also had her brother; Robert (father of the Moody Brothers) move into the High Street house sometime before 1871, where he died on 1st March 1875. As shown in the article below, Harriett was clearly not living alone here in 1896. 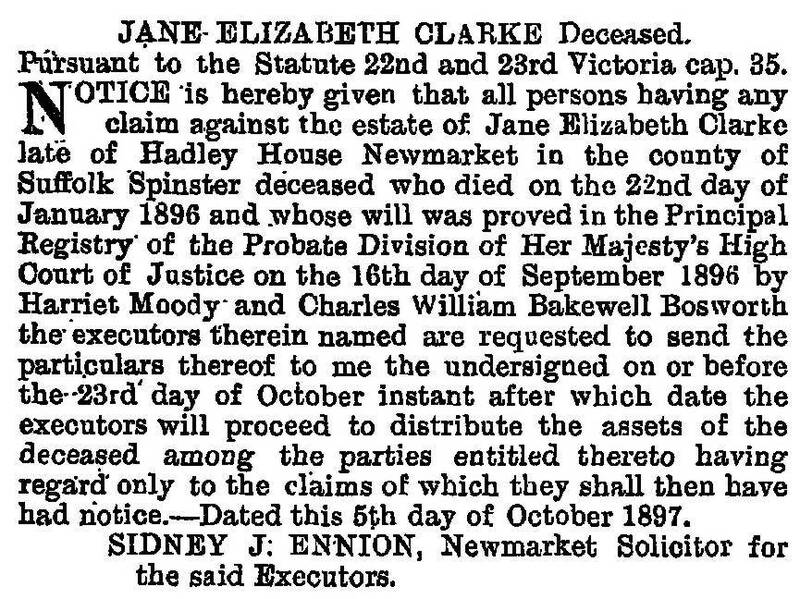 Jane Elizabeth Clarke was the widow of Thomas Henry Moody who'd died in Shaftesbury, Dorset in 1895. Thomas was a butcher and just prior to his death had been living in Dorset, while Elizabeth had been living back at Newmarket since at least 1881. In 1861 the couple were living together at Great Yarmouth, but by 1881 Jane was living here in Hadley House with Harriett - being listed as her niece. Though not shown on the Moody family tree on the page for the King's Head Brewery, Thomas was the son of Harriett's brother William Moody Hassall (1810-1895) and his wife Elizabeth (neé Rayner) - i.e. Thomas was Harriett's nephew. Thomas and Jane married on 14th February 1860 at St Mary's church. But by 1878 they'd clearly separated as Thomas was the father of Robinette Moody and Jane wasn't the mother. William Henry Moody followed in 1881, Tyrell William Moody in 1883, Phyllis Moody in 1885, Lauranette Emma Moody in 1888, Elizabeth Emma Moody in 1891 and Robert Moody in 1894 - all born in Shaftesbury, Dorset. His new wife's name was Emma (neé Case) - she was the daughter of Samuel & Sarah and was born in Shaftesbury in 1854. It's not clear whether Thomas actually ever married Emma though; as there appears to be no record of their marriage anywhere. The end result of all this is that we now have a whole branch of the Moody family that lives in Dorset. Separated from Thomas and moving back to Newmarket, Jane had gone back to using her maiden name of Clarke. By 1891 Harriett and Jane had been joined here by Charles (William) Bakewell Bosworth and 18yo Kate Moody (born in Cheveley). Charles was the manager of the brewery and details about him can be found on the page for the King's Head. He later moved into Albion Lodge. Robert's son-in-law; Thomas Ennion, had Deva House (No.90) constructed at the rear of the King's Head courtyard in about 1869 - for more details about the Moody and Ennion family links see the page for the King's Head Brewery. Local Board - The usual meeting of the Local Board was held on Monday week, when there were present Messrs. C. Diver (chairman), T. Ennion, G. H. Yerrall, S. Westley, S. Quince, J. Rogers, R. Rodrigo, T. Jennings, jun., and J. Button (clerk). - The Chairman said the Jubilee Committee desired permission to erect the memorial on a site close to the tripod lamp. - Several members complained that a plan was not before the Board, but eventually it was resolved that leave be given for the erection of the memorial between the tripod lamp and Dr. Fyson's footpath, in such position as the Surveyor's Committee might approve. - Complaint was made of the non-lighting of the Chapel clock. - The Chairman said he ordered its discontinuance because he was told the apparatus was disordered and wasted the gas. - Some members thought the Board should have been consulted, and eventually it was resolved to light the clock as hitherto so soon as the apparatus had been repaired by the owners. - Mr. C. F. Moody attended the Board and complained that J. Lillford, the toll collector, had insulted him with regard to the space before Miss Moody's house in High street being occupied with barrels ; a protest was also received from J. Lillford as to the use of the space by Miss Moody. - Both matters were deferred until next meeting. - Mr. Ennion gave notice to move that endeavours be made to purchase the market tolls, and also for the appointment of a committee to draw up new bye-laws. 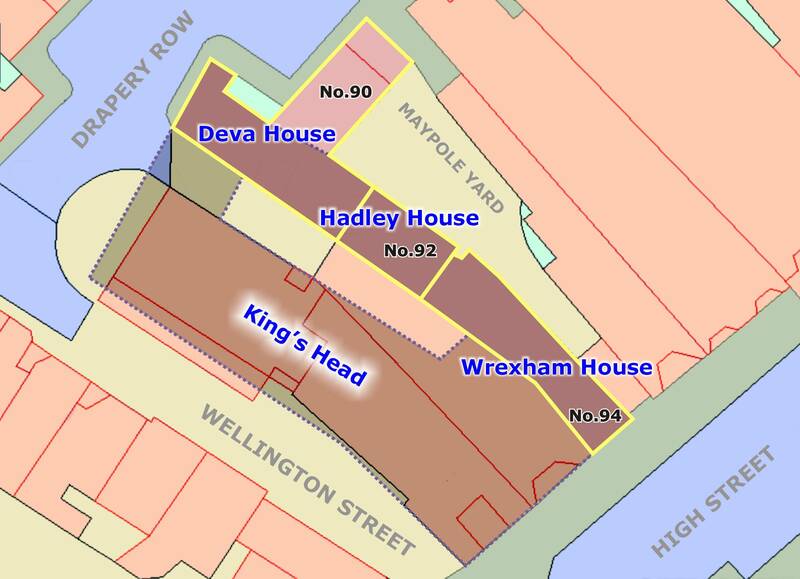 Although clearly a separate property in 1871 it isn't until 1900 that Joseph & Sarah Jessie Simpson, Greengrocer & Confectioner are specifically shown living in what is then called Wrexham House. Referring to the picture in the Photos section below showing the High Street c. 1890 it is clear that this is the same building that exists today - 3 stories high and extending over the entrance into the courtyard, also with an attic window in roof ... maybe even the same attic window that Sarah Jeffery jumped from(?). There's no door onto the High Street in 1890, but by the photo taken c. 1911 the shop front of the Maypole Dairy has appeared ... and the dairy is definitely listed as being in Wrexham House. These photos do show that Wrexham House was built before 1890 and maybe considering the circumstantial evidence of the attic window (it is about forty feet to the pavement from this window) even before 1862. One final point to note is that in all the photos up to 1927 that there's only one attic window in the roof, all the later photos show two spaced apart - the replacement of the one with the two obviously happened fairly recently. The photo below (taken c. 1987) is probably the strongest actual physical evidence that the brewery / inn did exist at this location - it's taken from inside the cellar of what was Hadley House, below that part of Ennion's Solicitors at this time. It shows the inside of what was the courtyard trap doors and the dray delivery chute - where the barrels of beer were delivered down into the cellar. It also confirms that what is still know an as 'Ennion's Courtyard' or the 'Maypole Yard' (after the dairy that was in No.94) was originally the dray delivery yard. From Chapman's 1768 map shown above it can be seen that the yard was open at both front and back and horse and carts would have been driven into this yard to collect and the deliver the beer barrels to the brewery / inn. Many thanks to Peter Norman for his details about the Newmarket Street Market Map 1904 and for the photo of Ennion's cellar, and to Tony Pringle for his information about the history of the pub. Many thanks to Valerie Archibald Embrey (granddaughter of the famous jockey Henry Jelliss) for the above photo of her father. Proposal Change of use of ground floor to A3 use (food and drink) and first and second floors to residential. Proposal Externally illuminated fascia sign.